The Top Site for Sponsored Social Messages is (not Facebook)… | ASTRALCOM - Content Strategy, Conversion Marketing and Customer Acquisition. 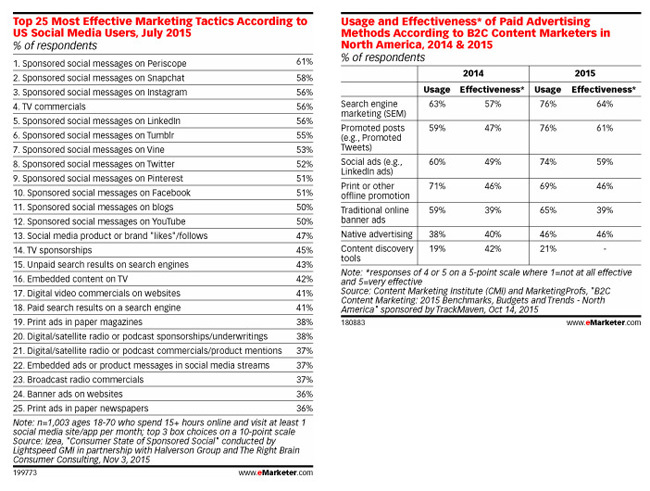 eMarketer has some new information in a new post regarding the effectiveness of sponsored social messages. The eye-opener here is that Periscope and Snapchat both beat out Facebook and Twitter for the number 1 and number 2 spots, respectively. Is your business using sponsored social posts in its content marketing strategy? Sponsored social posts are a fantastic way to keep your current customers and followers inspired by and up-to-the-minute with your brand. Of course, it’s also a great way to reach and connect with new customers. Want to start a sponsored social posts effort? Want to get better results from your content marketing? Click or call us and we’ll help you win at content marketing. How Important is Your Newsletter in Marketing?